This image shows a close-up view of the Valles Marineris canyon on Mars. It was created from a composite of images returned by the Viking orbiters. Valles Marineris is the largest canyon in the solar system and is five times deeper than the Grand Canyon on Earth. 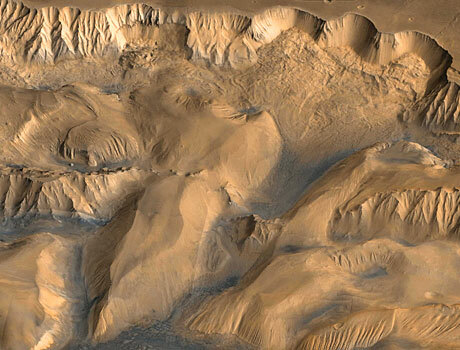 It is sometimes referred to as the Grand Canyon of Mars. Scientists are still not sure exactly how this enormous canyon formed. Some of the theories about it formation include asteroid impact and volcanic activity.